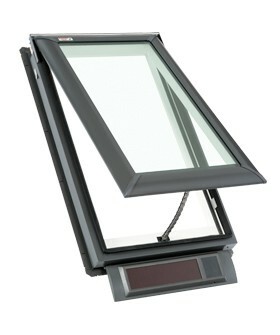 Choose a blind to control the light from your skylight! Rough opening measures 21" x 37 7/8". The Solar Powered "Fresh Air" Skylight features a solar panel that captures any available daylight and uses it to recharge a highly efficient, fully concealed, battery powered operator and control system. The battery powered operator is the power source that opens and closes the skylight and the solar panel serves as the charging source of the system. Price includes remote control for operation of the skylight. Solar powered blinds are optional and can be factory installed if ordered with the skylight. VSS C04 - Fresh Air Solar Powered Deck Mount Skylight - Shipping Included! Adding fresh air and ventilation to your home is essential to health and well-being. With the help of the sun you can now bring that breath of fresh air into your home. The solar powered "Fresh Air" skylight installs just like the other VELUX models and requires no wiring. Eligible for 30% Federal tax credit! With an integrated rain sensor the solar powered skylight will close automatically, in case of rain or inclement weather even if your not home. The VSS skylight installs on roofs with slopes between 14° (3:12) and 85° (137:12). The VSS remote controlled solar powered skylight installs right out of the box and does not require any wiring which makes for easy and cost effective installation! No need for the additional cost of an electrician or to open walls to run wires! The VSS skylight opens and closes quietly from anywhere in the house using our new innovate RF remote control (included). If purchased with factory installed blinds, the remote is pre-programmed for operation of blinds and skylight. Eight factory installed blinds are available to include in the purchase of your skylight! Blinds come in solar powered blackout or light filtering options. Blackout blinds - blocks 98% of light, available in 5 standard colors for factory installation. Light filtering - translucent blinds to diffuse light and allow privacy; avaiable in 3 standard colors for factory installation. Factory installed blinds use the same remote as the skylight and remote is pre-programmed by the factory. Over 80 special order blinds are also available for separate shipping; cannot be factory installed. The VSS skylight comes with pre-finished white frames and sashes that eliminate the need for secondary high cost trips by a painter. An insect screen, a stainless steel chain operator and aluminum is also included in the package. Smooth, low-profile does not obstruct your roofline..Solar panel elevated off the roof deck to allow shedding of roof debris. Our included filler piece provides a clean interior finish when replacing older "drop-in" or "flush-mount" skylights. The No Leak Skylight carries the 10 year installation warranty plus 20 years on insulated glass seal, 10 years on product,and 5 years on the blinds and controls. This video showcases the many features for the new Solar Powered "Fresh Air" Skylight including ease of installation, federal tax credit savings and other benefits. 3 Reasons to replace your old skylights with the new VSS "Fresh Air" Solar Powered Venting Skylights. This video explores the installation process for deck mounted venting skylights. If you are interested in a specific installation step, you can select from the scenes listed.